Do you want to have a laptop that looks nothing like what everyone else around you has? 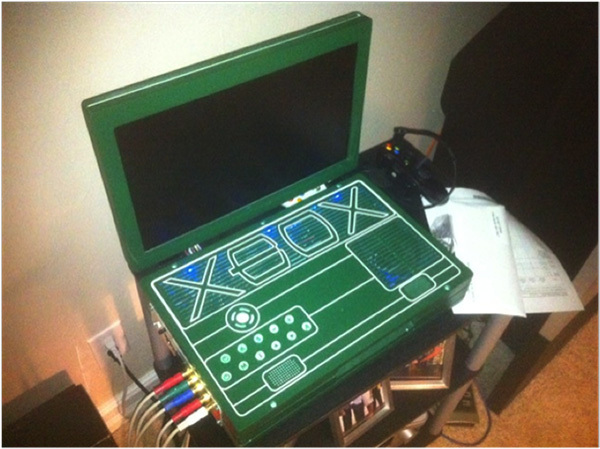 There is something to be said about having a unique laptop, and if you have the money to throw away, here is something that might make you say “Want it!” – a laptop made out of an Xbox 360. The concept is definitely not a new one. Indeed, there are already established names that have been doing this for a while – and selling their creations, too. The thing is that, as can be expected, their custom laptops cost an arm and a leg. There’s a newcomer to the scene going by the name of Ed, and he has made it his mission to make it relatively cheaper for people to get their hands on these cool mods. He is now offering custom made laptops made from the Xbox 360. The finished product looks like this. Personally, I wouldn’t want a laptop that looks like that. One, it is green. Why would I want a green laptop? Two, it is an Xbox 360. I’d rather have a PS3 laptop. Then again, it is a matter of preference, and if this is your thing, you now have the chance to get your hands on one. More so, you really have to give Ed a thumbs up for the effort. Here’s the laptop in action. How much will this set you back? For the entire set up with all the materials shouldered by Ed, you need $1600. (I did say “relatively” cheaper, didn’t I?) If you provide the Xbox, you get $200 off. You can get an additional $50 if you go for no LEDs (vent lights and backlit buttons. Another $50 off if there is no component out, and $100 if he doesn’t paint it for you. There’s a freebie – custom logo engraving, as long as it is not copyrighted. And if Ed provides the Xbox, he also gives one free controller. Find out more from Edsjunk.